A relative of kingfishers, puffbirds are well-named for their “puffy” appearance—large head and round body, short neck and tail and long, stout bill. The White-whiskered Puffbird is a common resident of the forest understory; however, due to its habit of perching silently for extended periods of time, it is easily overlooked. At 18 cm in length, it is a relatively small member of the family Bucconidae. Males and females are similar in plumage but can be distinguished—males are rufous-brown above with light brown spotting on wings and back, bright tawny throat and chest, and streaked underparts. Females are slightly grayer above with less streaking below. Both males and females have prominent white tufts on the face, forming “whiskers” on the sides of the bill. White-whiskered Puffbirds perch motionless in the lower levels of the forest and are usually rather tame, allowing close approach. They are often found in pairs, and are generally silent; however, will give a high, thin whistle. They feed on insects and small vertebrates including lizards and frogs, and sometimes attend army ant swarms and occasionally feed in mixed feeding flocks. Breeding season for White-whiskered Puffbirds is from May to August in Panama. Like their kingfisher and motmot cousins, they nest in burrows on banks or slightly sloping ground. Cavities are excavated by the pair and are up to 56 cm long; adults line the cavity with dead leaves, as well as disguise the entrance hole. The female lays 2 glossy white eggs; the males incubate the eggs at night and females incubate during the day. When the chicks hatch, the male broods the chicks and the female brings food to the nestlings. After 7 days, the chicks are less accompanied by the male. Although altricial, chicks are mobile from a very young age and fledge 20 days after hatching. 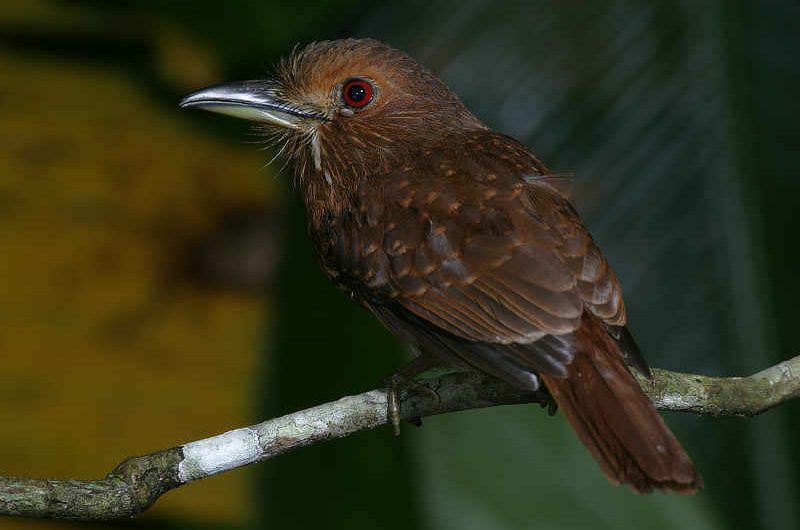 The family Bucconidae comprises 35 species found only in the Neotropics and includes puffbirds and their close relatives, the nunbirds, nunlets and monklets. The White-whiskered Puffbird was formerly called the Brown Puffbird or White-whiskered Soft-wing due to its loose plumage. The charismatic White-whiskered Puffbird ranges throughout Central America from southern Mexico to western Ecuador in lowland forest up to 1200 m, and can be found commonly near the Canopy Tower, particularly on Semaphore Hill Road, Plantation Road and the world-famous Pipeline Road.